You have stumbled upon my domain. Years and years of cosplaying carefully dicated here for your boredum ;p This goes through MANY MANY MANY years. I should be ashamed that I have pictures that go back this far, but after so many years of cosplaying, one does gain a collection of photos from over the years. I'll try my best to dictate, but since it's been like... 4 + years of this, I honestly can't remember everything that happened at that convention that year. Got any comments? Questions? Do I have a picture of you without a name associated with it? Let me know! To be honest, I don't see myself as a cosplayer. But ever since the begining I've really been pulled into the world of Cosplaying and now I really just can't stop! I keep eating and eating! Anyway... here's my email, nuriko@maison-otaku.net. Mental note - All the pages are VERY image intensive. There will be a bit of loading with each page, so be patient! I will put credit where it is due. Please do not take pictures from my page to put on your own! If you see a picture that you would like, please let me know and such. It's just politeness. A lot of the pictures I've taken or had friends taken and I've scanned on my own, so there was at least some work put into this. Thanks. Anyway, here are the scary pictures! What I'm going to do is set it up in years. What characters I was dressed as, etc, etc. Mental note: Ever since I started attending Fanime, I've had a tradition where I would wear the costume from the previous year as my costume. I've kept this up in the tradition for the following years. This was basically because Fanime 1998 was a random act, and so it has kind of stuck. I feel that Fanime is a con connection to the 'previous con year'. Okay. That's all I wanted to make a point of now. 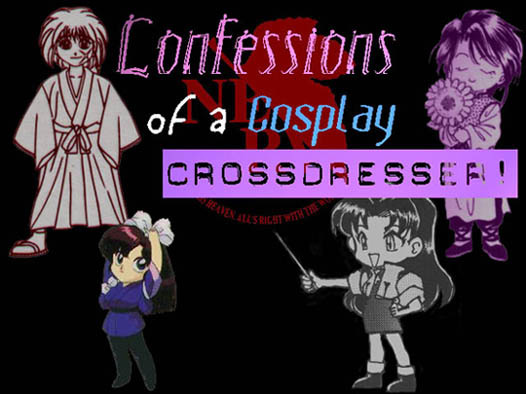 1998 Cons Attended: FanimeCon 1998 - Dressed as Nuriko Project Akon 9 Anime Expo 1998 Anime Fest 1998 Anime Weekend Atlanta 1998 VegasCon (Hahahaha) GenkiLand!